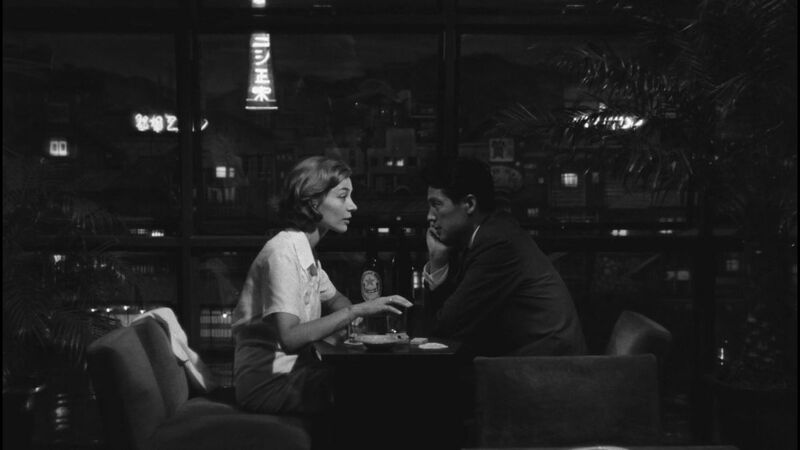 Hiroshima mon amour began its life as a commission to director Alain Resnais. Fittingly, he was to make a short documentary about the atomic bomb. Though the process of creating it seemed straightforward enough, Mr. Resnais ran into a bit of a problem. In 1955, he had made a documentary about the Holocaust entitled Night and Fog. As a result, he spent several months confused about how he could proceed without effectively recreating his previous work. On top of this, how could he even begin to show the devastation the people of Hiroshima endured in a way that allowed his audience to fully comprehend its enormity? The opening of the film seems to reflect Mr. Resnais’s headspace as he began his project. The stock footage shows the horrifying effects the atomic bomb had on the survivors. Those who weren’t vaporized instantly died agonizingly slow deaths. Stock footage is stitched together to show the brutality of the attack. Corpses are charred and blackened beyond recognition, the survivors’ skin is peeling off, and women give birth to children with defects. In the confines of the narrative, this is what the actress learned from visiting the various museums scattered throughout Hiroshima. In other words, her knowledge is the audience’s knowledge. However, after telling him what she learned, he merely responds, “You saw nothing in Hiroshima. Nothing”. It’s rare for such an impactful line to be dropped so early in a film, yet Mr. Resnais used it to provide many layers of meta-commentary – all within the first ten minutes. Much like how the director found himself unable to properly depict Hiroshima in the aftermath of its bombing, the audience couldn’t possibly begin to comprehend the tragedy unless they lived through it. As nightmarish as the stock footage is, the average viewer would only know but a fraction of the horror from watching it – it’s not a question of how empathetic they are. One of the most interesting points raised in their conversation concerns what Hiroshima means to the architect and the actress. The actress obviously wasn’t in Hiroshima when the bomb dropped, so to her, the city simply represented the end of the war. To the architect, Hiroshima entails all of the imagery found within the stock footage multiplied by an immeasurably high factor. He wasn’t in Hiroshima, for he been conscripted into the Imperial Japanese Army. Nonetheless, his family was there on that fateful day in August of 1945, meaning the full extent of the bomb’s impact awaited his return. Even so, the city, and by extension, the man from Hiroshima can also be seen as a symbol of resilience. The city has several memorials, exhibits, and museums to ensure the devastation is never forgotten, yet the people also seek to move on. Fittingly, the man’s occupation is symbolic of the city’s desire to look to the future despite a traumatic past. Looking at the city just fourteen years later demonstrates just how successful they were in this regard. At the same time, the film seems to make the case that, even if one hasn’t lived through such a publicly life-altering event, they can relate to the pain in a more roundabout way. During the Second World War, the actress fell in love with a German soldier. Though the love between them was genuine, the circumstances rendered it doomed from the beginning. After all, Germany had been invading France, so any romantic feelings she would have for such a man was tantamount to treason in the eyes of her friends, family, and government. As punishment for this indiscretion, her head is forcefully shaved following the liberation in 1944. This development allows the director to compare and contrast a public tragedy with a private one. An event that signified the final phases of the war resulted in the actress losing her hair. When something like this typically happens, you can expect either a character or the narrative itself to tell the person who endured the low-key hardship to quit their whining because they don’t know what true suffering is. Mr. Resnais doesn’t do this; while having one’s hair shaved as a result of treason isn’t on the same scale as the people who lost their hair as a result of radiation poisoning, the pain she felt was no less real. One of the most striking things about Hiroshima mon amour is something the watcher might not pick up on during their first viewing. Nearing the end of the film, the woman despairs over the fact that she cannot remember the architect’s name. This is when you realize you don’t know the answer either; the characters do not have names. It makes for a remarkable contrast; the two engage in an affair, which would be a highly personal relationship by default, while the film gives it an overall impersonal tone. It lends the proceedings a degree of applicability. Even if nobody in the audience is old enough to have lived through the war, it allows them to grasp that there were many other stories out there like those of this film’s leads and how the full scope of the conflict and its impact on every living person couldn’t be fully comprehended. In the final scene, the actress says the architect’s name is Hiroshima, which he confirms. He, in turn, says her name is Nevers. Just when we’re about to gain insight to these characters, the film denies us the answers by ending abruptly. Does the actress stay in Japan? Does the romance end there? Will their spouses ever learn of this affair? What makes this non-ending work is how it places the onus on the audience to draw their own conclusions. Being a work of fiction, it’s entirely possible that these two characters are merely personifications of their hometowns and the narrative was a commentary on these the relationship between these two countries after the war. Because there are as many interpretations as there are people willing to watch this film, it’s impossible for there to be a definitive answer, and its noncommittal nature adds to the appeal rather than making it come across as an incomplete work. 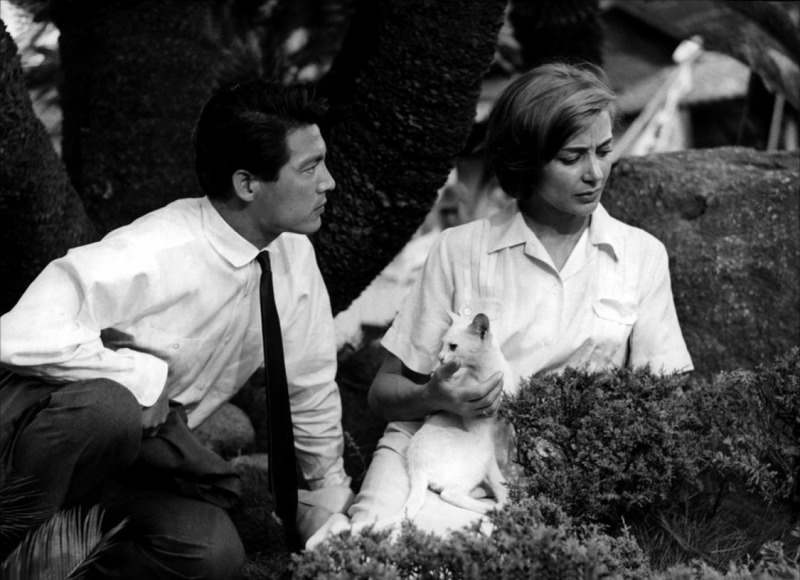 Hiroshima mon amour is considered one of the most influential films of all time. Its minimalistic cast and small-scale setting ensured it both launched the French New Wave in earnest while also being heralded as one of its hallmarks. When it comes to filmmaking, adopting a minimalistic approach can be considered far more difficult than attempting to create a grand, sweeping epic. While an epic can afford to have a weak moment here and there, a minimalistic film needs to get the most out of the few moving parts it has. In this regard, Hiroshima mon amour succeeds on nearly every front. It’s a remarkable technical achievement, which is particularly evident in the performances Mr. Resnais managed to get out of his two leads. Emmanuelle Riva as the actress is impressive in of itself, yet Eiji Okada’s depiction of the architect is the kind of performance you only see once per generation – if you’re lucky. Why do I say this? It’s because he didn’t actually know French; he recited all of his lines phonetically. You would never know this watching the film because his dictation is superb. Giving a convincing performance in your native language is one thing, but doing so in a tongue of which you have no mastery is nothing short of phenomenal. 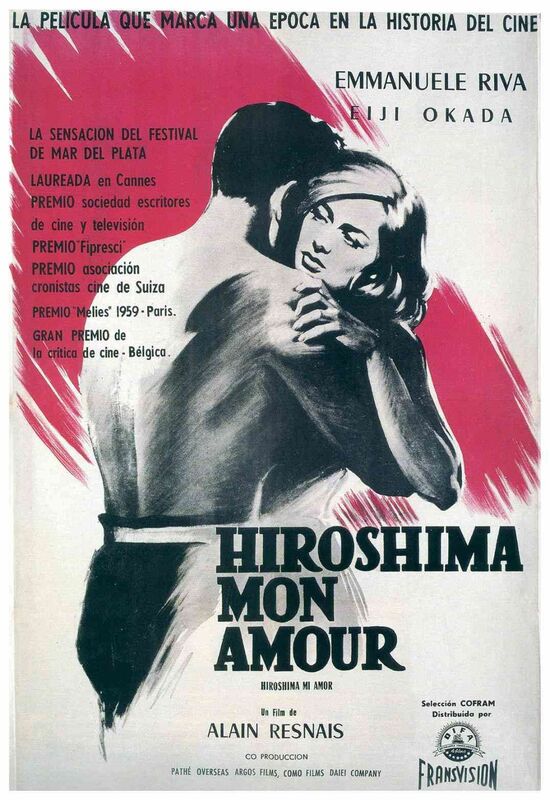 As a result of its legacy, American film critic Leonard Maltin once declared Hiroshima mon amour the French New Wave equivalent of The Birth of a Nation. Admittedly, this can come across as a rather backhanded compliment because it suggests that Hiroshima mon amour has aged very poorly. In reality, it has held up reasonably well over the decades with Mr. Resnais using his unique, innovative style to an excellent effect. It’s a story with a powerful auteur voice behind it, yet there’s not a trace of pretentiousness or egotistical posturing to be found. Because of this, I can recommend this film to anyone who fancies themselves a fan of the medium. Thanks! I’m glad I was able to do it justice. It’s difficult to create a work with so few moving parts, but I’d say Mr. Resnais succeeded. The dialogue is something else, isn’t it? He succeeded completely. The dialogues… Absorbing and pronounced with such energy and affection… Didn’t know that the Japanese man didn’t know French, amazing!